Sydney Smith Garage Ltd of Purley, 1954. 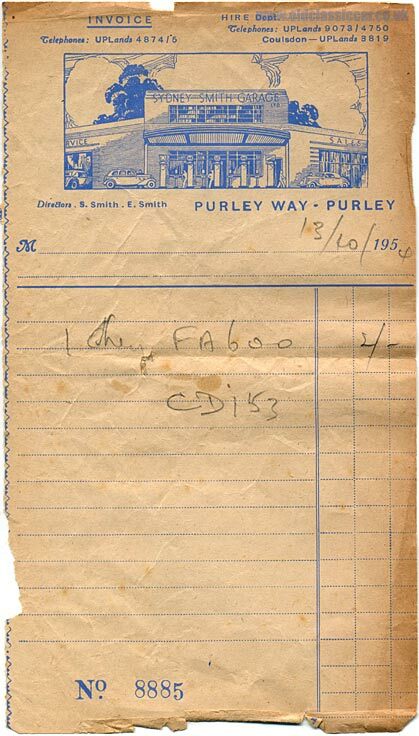 The following invoice, printed on the thinnest paper imaginable, was handed over by a member of staff at the Sydney Smith Garage Ltd, of Purley Way in Purley, Croydon, in October 1954. The illustration of a vintage-era garage, complete with pre-war cars, petrol pumps and attendants, appears to hark back to an earlier time. Evidently this was an eye-catching establishment of some prominence in the area, which handled not only the retail of petrol from a selection of different pumps, but also car servicing and sales. The directors are given as S. Smith and E. Smith. Other than a reference online to a number of Fiat 500 Topolino Siata Smith Specials being modified and sold at this establishment prior to WW2, there seems to be little information around regarding this business. Does the building survive, or has it been swept away during re-development works? Shown below, a larger view of the impressive garage frontage. A two-door coupe can be seen to the left, its nose pointing into the workshop area, while close by a six-light saloon (its driver behind the wheel) is being attended to by a member of staff. Three more attendants are lurking behind the pumps, while to the right the driver of a low-slung car - possibly a Citroen Light 15 / Traction Avant Coupe - is in discussions with another garage operative, perhaps following a test drive.